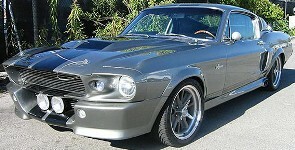 The 1967 Eleanor Mustang was first conceived for the 2000 movie Gone in 60 seconds remake starting Nicolas Cage. Eleanor was designed by Steve Stanford (Hot Rod illustrator) and Chip Foose. The movie cars were built by Cinema Vehicle Services (CVS). Due to popularity of the movie and car, aftermarket kits are available to create your own.